We all know Florence Nightingale as the “Lady with the Lamp” and the founder of modern nursing across the world. However, there is much more to learn about this remarkable woman whose influence extended to nursing, health care and social reform, army health services, religion, statistics and more. 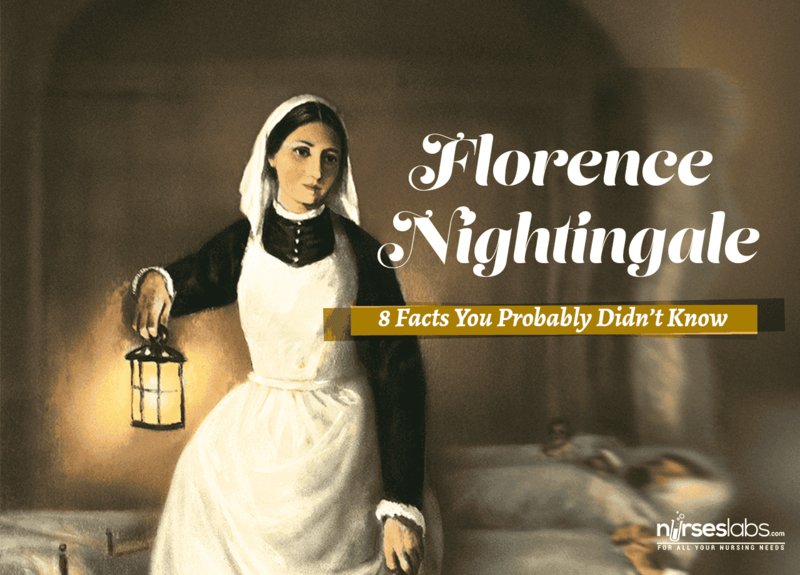 Here are some interesting facts about Florence Nightingale you may not have known. 1. Florence Nightingale was deeply religious. 2. Nightingale got her first nursing job at the age of 33. 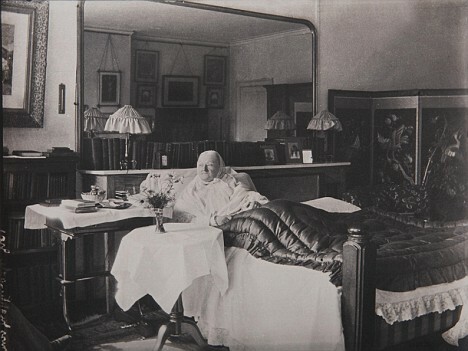 Nightingale was born as a member of the upper classes where the role of the women in society was to do the social rounds, marry and have children. From a young age, she was could not accept this as her future, and even turned down proposals of marriage as it would interfere with her work. 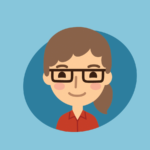 She had to fight strong opposition from her family to her achieve her ambition of becoming a nurse. Eventually at the age of 33 Nightingale was appointed as superintendent at the new Hospital for Gentlewomen in Distress. 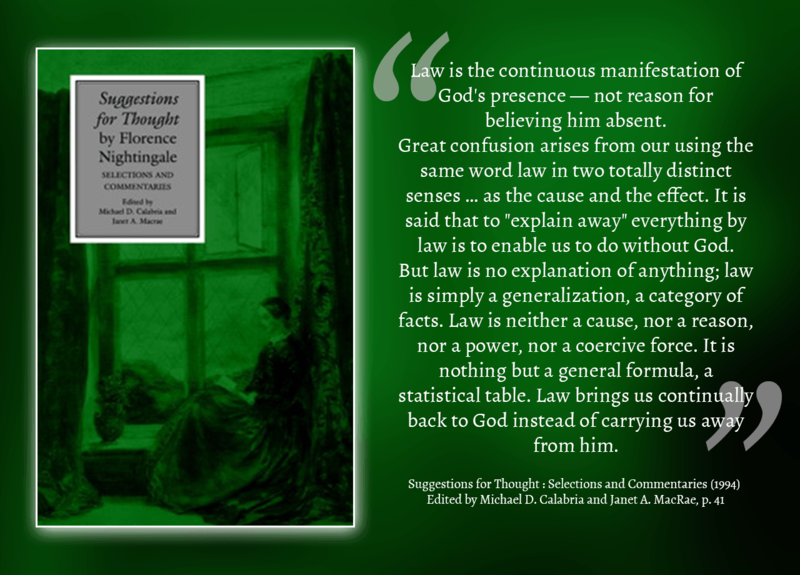 Her drive as a social reformer and patient advocate was already evident in this position as she battled and eventually won over the hospital’s committee to admit patients of all faiths, rather than only those who belong to the Church of England. 3. The greatest contribution of “The Lady with the Lamp” relating to the Crimean War was not direct patient care. 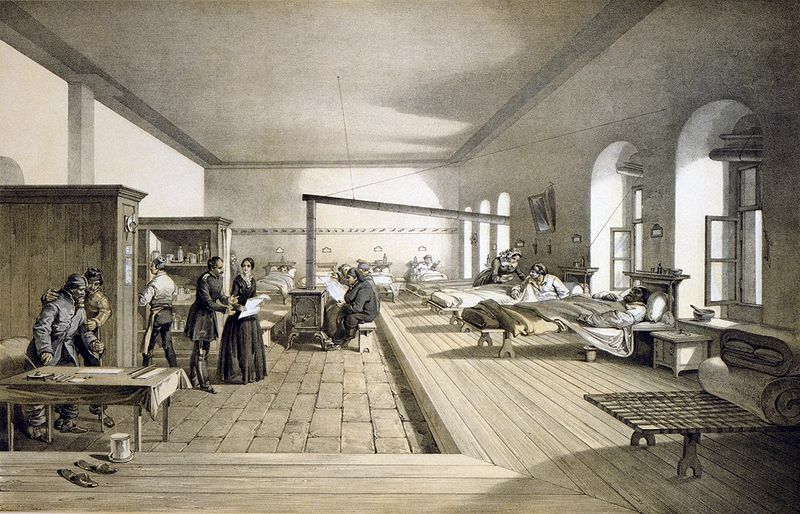 Nightingale’s main influences on reducing patient deaths at Scutari Hospital was overcoming opposition by medical practitioners, organizing the hospital, improving the environment and obtaining supplies. 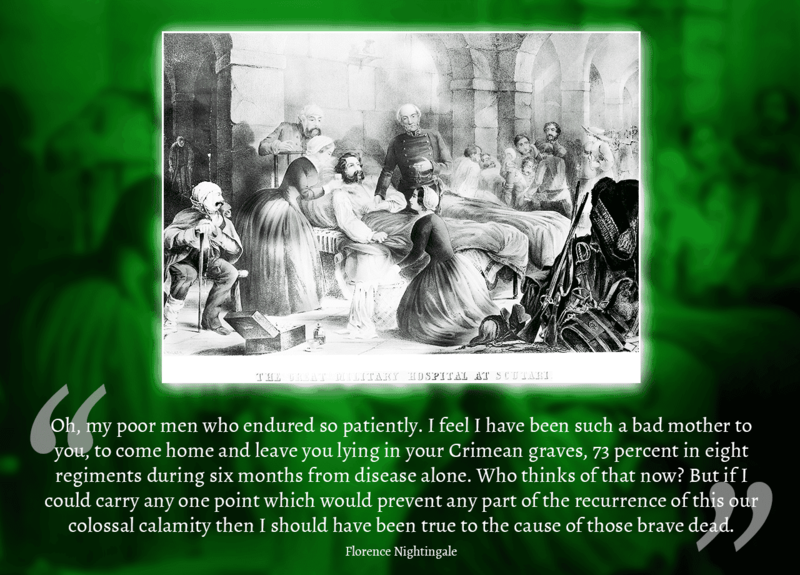 Troubled by the unnecessary suffering and death in the Crimea, Nightingale’s greatest contribution was after the war. She met with Queen Victoria and, after gaining her support, convinced the government to set up a commission of inquiry into the health of the army. 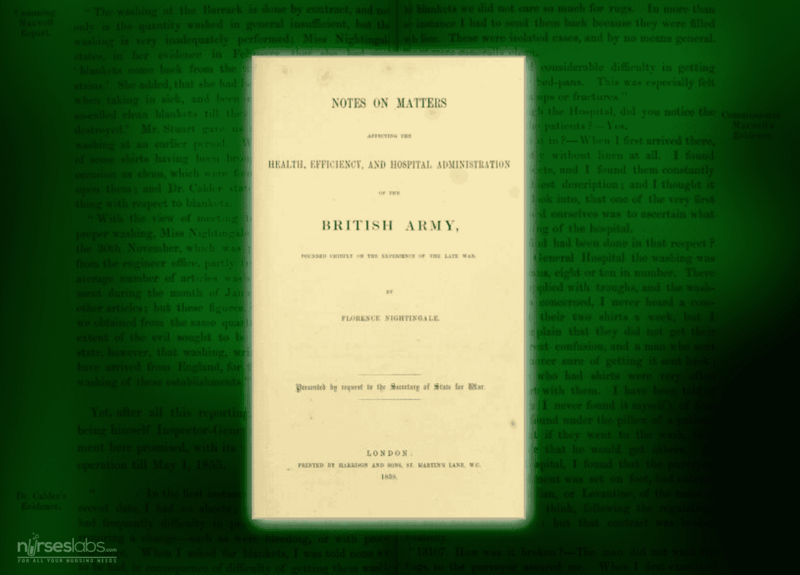 While still exhausted and ill from the Crimean Fever which she contracted while overseas, she prepared a 1000 page report of tables and statistics, entitled “Notes on Matters Affecting the Health, Efficiency, and Hospital Administration of the British Army”. The Commission’s Report led to far-reaching changes to health services in the British Army. You can read the digitized version of this here. Nightingale was left weak and ill for the rest of her life after she nearly died from the Crimean Fever (probably Brucellosis). At age 40, when the Nightingale School was founded, she believed that she was at the point of death. However, she lived and worked ceaselessly for another 50 years and died at the age of 90 in 1910. Most of her work was done from her bed or her couch, sometimes with the assistance of friends. 5. Florence Nightingale is acknowledged as a role-model for patient advocacy. Nightingale’s life was dedicated to reforming the causes of ill health and improving the care of the sick. Besides establishing nursing as a profession for educated women, she worked on reform in health administration, poor law legislation, public health, and army medical services. Nightingale’s toughness, brilliance, and upper-class background enabled her to deal with royalty, cabinet ministers, and ambassadors to achieve her goals. She was a political activist and engaged in extensive lobbying to convince leaders to implement the progressive social reforms she suggested. Nightingale is often criticized for not having actively supported some of the major causes of her time. She was however not prepared to be distracted from focusing on her goals and the action needed to achieve them. There is a movement today which censures her for not supporting the feminist movement, and having contributed to nurses remaining in a subordinate role. Careful analysis her life, actions and actual writings about the role of women, shows this to be far from the truth. 6. Florence Nightingale is an acclaimed statistician. From a young age Nightingale had a flair for figures and at one stage she had even considered becoming a mathematician. Before the age of 30, she had already collected and analyzed a large amount of statistics on hospitals throughout Europe. She used tables of statistics and graphs widely throughout her writing to illustrate her points. 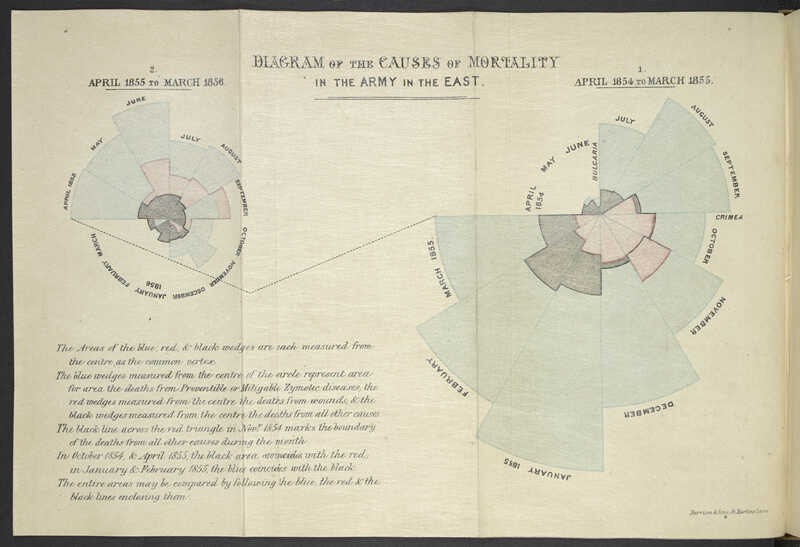 Nightingale’s famous polar diagrams showing the causes of mortality in the army. She created many novel graphics to present statistics that would persuade Queen Victoria of the need to improve sanitary conditions in military hospitals. The area of each region shows the number of soldiers who died of wounds, disease, or other causes, during each month of the Crimean War. Nightingale was elected as the first female member of the Royal Statistical Society in 1859 and was also made an honorary member of the American Statistical Association. 7. Florence Nightingale was a prolific researcher and writer and still inspires scholars today. The Florence Nightingale Digitization Project – a website where you can read the old letters and works of Nightingale. More than a century after her death, besides her books and reports, there are at least 13,000 letters written by Nightingale in public archives and private collections. She was also the shadow author for many official government documents on health care and the military. The “Collected Works of Florence Nightingale” has recently been published in sixteen volumes. In 2014 the Florence Nightingale Digitization Project was started and already the database consists of has 1,900 handwritten letters available to researchers in a single web-based source. In 1890 Edison recorded a greeting from Florence Nightingale on his Paraffin Wax Cylinder which is now available on YouTube. The purpose of the recording was to help raise funds for impoverished veterans.